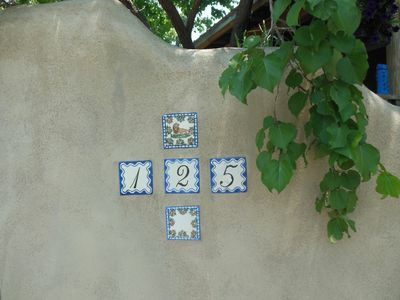 Cielo Vista, Spanish for ‘Sky View’ is the name of our gorgeous adobe home and guest house in Northern New Mexico. 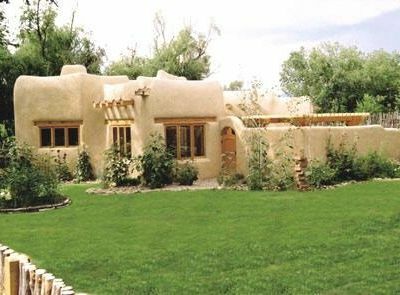 Here, just north of Taos and close to the bucolic town of Arroyo Seco, your eyes are constantly filled with all that is beautiful and unique to the Southwest. 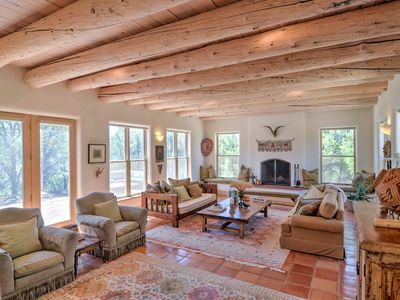 Set on four acres of high desert land in the area known as Arroyo Seco, complete with pinion, chamisa, locus and juniper trees, this single story real adobe home will afford you all the comforts of a very special Taos vacation. 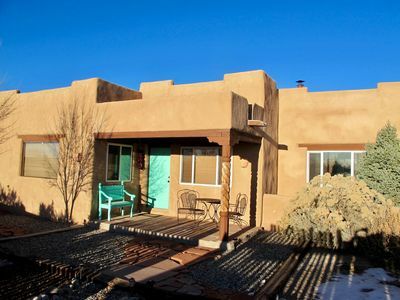 From the windows wrapping the front of this special 3 bedroom 2 bath spacious home and 1 bedroom 1 bath guest house, your eyes are drawn up to the beautiful and idyllic Sangre de Christo Mountains that turn brilliant crimson with each sunset. 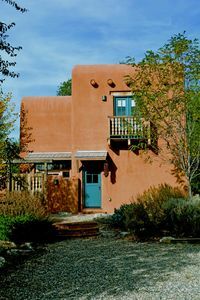 The Sangre de Christo's host the World Class Taos Ski Valley and thousands of acres of woods, streams and hiking trails. 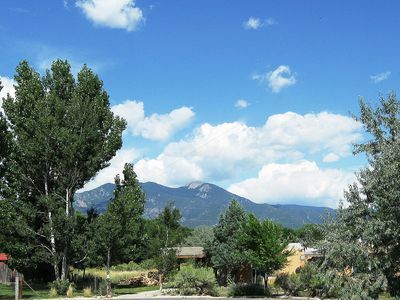 Cielo Vista is well located for your Taos experience and is just a short 2 miles from the hip town of Arroyo Seco. World Class Skiing at the Taos Ski Valley is just a 9 mile drive on Highway 150. 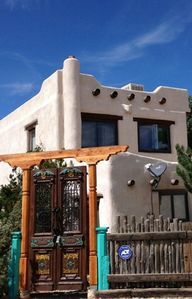 All that the Town of Taos has to offer: dining, shopping, galleries, movie theater, indoor community/family pool, live music and museums, are an easy 8 mile drive. 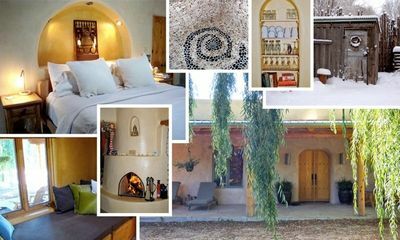 Cielo Vista is situated in the middle of all the abundant fun and extraordinary beauty of romantic Taos, New Mexico. 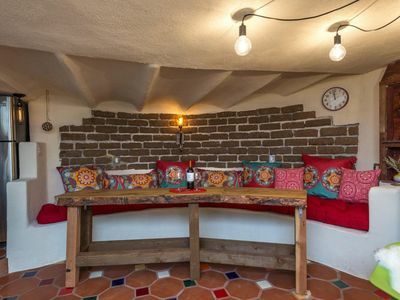 Complete with red saltillo tile floors and vigas in the ceiling (made of heavy pine beams) there is no mistaking the warmth and ambiance of an authentic southwest adobe home. Abundant light cascades through the many windows and skylights that frame the incredible views that only nature can produce. 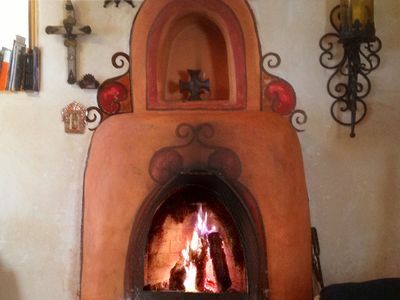 The living room large flat screen, plasma TV and is powered by Dish Network Satellite TV which offers group entertainment should guests be able to tear themselves away from the many Taos sites and activities. Washer and dryer on premises. 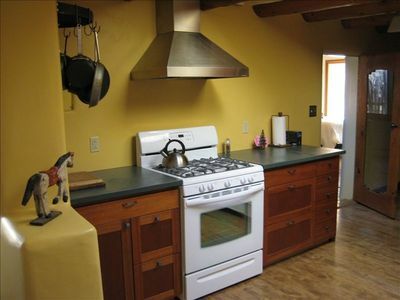 A fully equipped kitchen is ready for serious food preparation and for providing memorable culinary sharing. An outdoor built in Thermador natural gas barbeque grill makes grilling a wonderful outdoor experience for all. 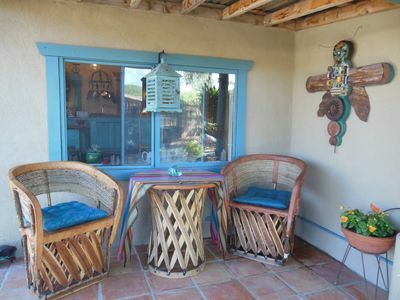 To add to the southwest ambiance is an outdoor Kiva fireplace with wood provided. 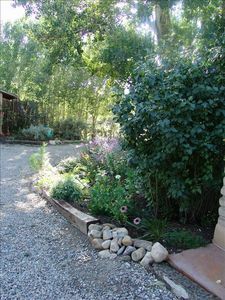 Outside, the rock garden with a water feature highlights the flagstone patio. A hot tub adds many a moon lit conversations or quiet peaceful stargazing. The six person hot tub sits next to a child's sandbox with an overhead ramada. The flagstone fire pit with built in benches is a favorite gathering spot for conversation on cool desert nights. 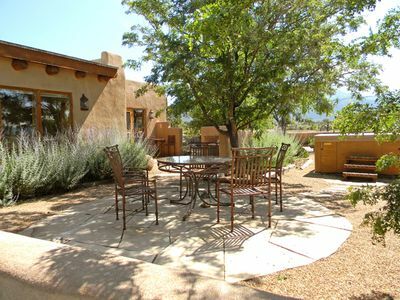 Sit at the 7 person glass table and chairs on the huge flagstone patio and admire the 60 mile view of mesas, vistas and distant mountains or slip into the magic of a hot tub after a full day of sight seeing, hiking, skiing, fishing, rafting or shopping. 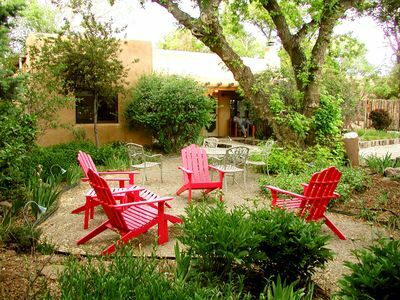 The Cielo Vista Guest House is a light, bright and spacious retreat with plenty of separation and privacy from the main house offering a full kitchen, with full size full oven/range and refrigerator and hot tub all its own! The great room has full floor to ceiling wall of windows flooding the room with light and giving an ambiance of spaciousness. Guests relish the luxury of having a private hot tub separate from the main house located on the flagstone patio also equipped with a dining table, chairs and a summer umbrella. Queen in bedroom + High Tech "State of the Art" King sleeper sofa in living room, manufactured by "American Leather Corp." and is touted as being more comfortable than most beds. The lucky guest who chooses this for his/her night's sleep is in for a rare new sleeper sofa treat. 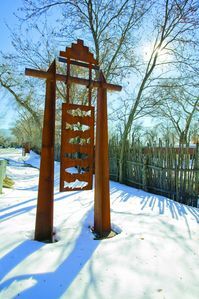 Escapada De Montoya - walk to historic Taos Plaza! 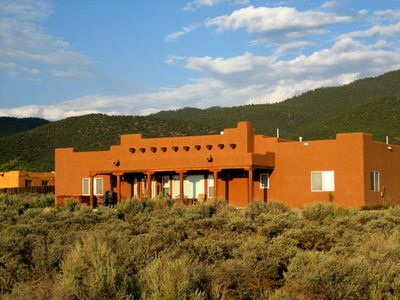 Custom Taos Home on 11 Acres w/ Outdoor Fire Pit!